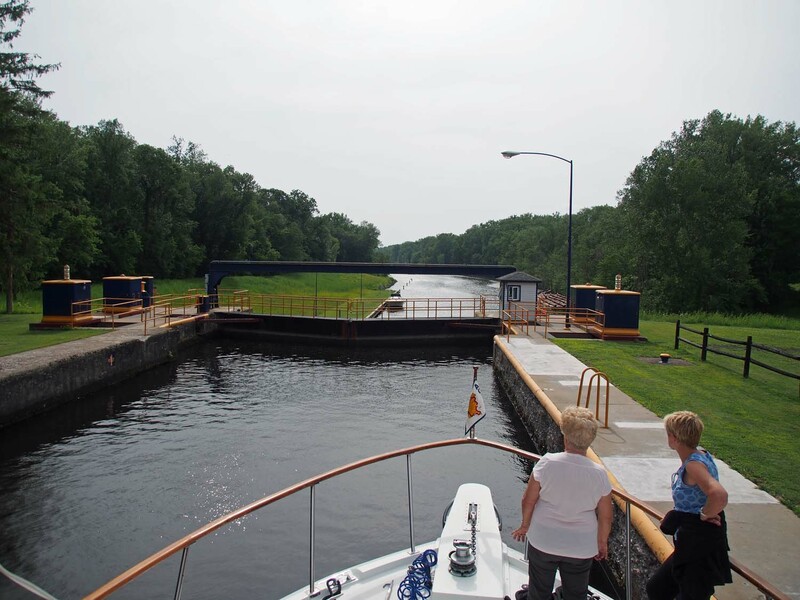 Only one down lock after Oneida Lake. Today we crossed Oneida Lake the long way, about 20 miles. Not too scenic since the lake is shallow. The deepest part is 45 feet, so we stayed in the center and watched for a few markers showing shallow spots. We zigged and zagged a little to keep our wake further from a number of small boats out fishing. After crossing we entered the Oneida River. This had houses and docked boats along both sides, since we were on the northern edge of the Syracuse area. We slowed down on this portion and seemed to just glide along with little noise or impact on the water. There was only one lock, down with no drama. We docked and took the loaner car to two supermarkets and stocked up on food and bottled water. Tomorrow we’ll finish this US portion of our trip in Oswego NY, on the south shore of Lake Ontario.